The Democrat-supermajority in the state Legislature and Democrat Gov. Jerry Brown passed and signed a law turning California into a “sanctuary state,” which prohibits local sheriffs, law enforcement and state officials from allowing federal immigration authorities access to illegal aliens in prison and jails. Senate Bill 54, signed into law by Gov. Jerry Brown last year also prohibits police from asking people about immigration status, or working with federal agents on immigration enforcement. County jail officials are also prohibited from working with immigration agents as they had in the past, but are allowed to transfer inmates to immigration authorities only if they have been convicted of a felony. 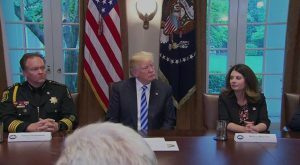 California Assemblywoman Melissa Melendez, R-Lake Elsinore, and more than a dozen elected California officials attended a meeting in Washington D.C. at the White House at the invitation of President Donald Trump to share their concerns over California’s “sanctuary state” law, Senate Bill 54. The elected officials met with the President for nearly 90 minutes. 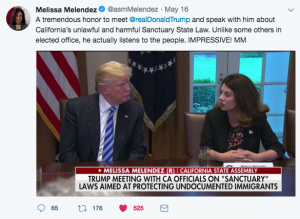 Melendez said the group of California elected officials, which ranged from local city council members, county supervisors, a Sheriff and a District Attorney, were there so the President could hear directly from local officials about the dangerous and volatile impacts of allowing illegal aliens into to their communities. Melendez and the lawmakers thanked President Donald Trump for his efforts to stop illegal immigration. Melendez said Trump is an “inspiration to a lot of people” and told him that many Californians are supportive of his plan to put an end to illegal immigration and open borders. Steinle was murdered by an illegal alien felon while walking on a pier with her father in San Francisco. Five time deported Jose Ines Garcia Zarate, an illegal alien, was acquitted of murder, involuntary manslaughter, and assault with a deadly weapon charges by a San Francisco jury. Jurors only convicted Garcia Zarat of being in possession of a firearm. Melendez said she and the Republican minority colleagues in the California Legislature are the answer to the Democrats’ “resistance” movement. “This is your Republican resistance,” she said. Also at the meeting were California Rep. Kevin McCarthy, U.S. Attorney General Jeff Sessions, representatives of Immigration and Customs Enforcement, and Steven Miller, policy director to the President. Melendez was the only California state legislator in the contingent. “You wouldn’t believe how bad these people are. 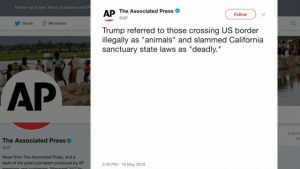 These aren’t people, these are animals, and we’re taking them out of the country at a level and at a rate that’s never happened before,” Trump responded. The Associated Press reported the President referred to those illegally crossing the US border as “animals” and slammed California sanctuary state laws as “deadly.” And then they removed their disingenuous Tweet. White House press secretary Sarah Huckabee Sanders told reporters on Thursday that the context of the comment was clear. Many major news organizations, including The New York Times, CBS News, NBC News, ABC News and CNN, among others, referred to the president’s comments without mentioning MS-13 in Twitter headlines to their millions of followers. This entry was posted on Friday, May 18th, 2018 at 1:05 am and is filed under Blog Posts.